Oak wilt is a very dangerous disease for your tree. We are fully prepared to make a professional diagnosis of oak wilt on your tree. We really couldn’t call ourselves professional tree care service if we didn’t know oak wilt like the backs of our hands. If you need a professional to give your tree a diagnosis for oak wilt, give us a call. While oak wilt is commonly known, that still does not make it any less deadly. It can spread from one tree to another rapidly, and cause tons of problems for entire forests affected by it. 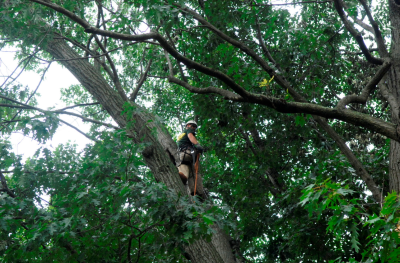 Whenever you begin to see signs of oak wilt on your trees, do not hesitate to give us a call. Quick timing of calls can mean the difference of life and death for your trees that are infected. Oak wilt can be very nasty when it is allowed to grow, so it must be treated efficiently. If you begin to see discoloration in your trees, this could spell disaster if it is not diagnosed and treated if they are infected with oak wilt. One of the things we pride ourselves with is our extensive knowledge of oak wilt and how to treat it effectively. If your tree begins to have signs of oak wilt, you should see this as a time to promptly call and get your tree diagnosed. Oak wilt is harder to remove each day it is allowed to spread. Past a certain point, the only option will be to remove it from the rest of your trees so that the disease will hopefully not spread to them. While there isn’t much you can do to protect your trees from oak wilt before it happens, you can certainly make the call to a professional as soon as you do see it happen. You may just save your trees life.